Welcome to The Ambassador Public House, a West Loop favorite specializing in classic European fare and global sports. 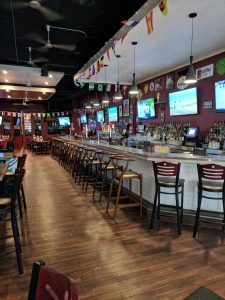 Pull up a seat at the bar and let our knowledgeable staff recommend one of our premium draft beers, or try one of our specialty cocktails. Our food menu features all of your European favorites including kabobs, fish and chips, and a traditional Irish breakfast (served all day), just to name a few! With 19 large HD TVs showcasing Football (Soccer), Football (American) Pro and College, Rugby, Ice Hockey, Basketball, Tennis, Golf, Motor Racing (Nascar, F1, Indy), Skiing, Horse Racing, Cricket and Darts from all around the world, we are Chicago’s global sports headquarters! Host your next birthday party, anniversary or engagement celebration, holiday soirée, corporate event or office happy hour with us! We offer prix-fixe menus for up to 100 guests in our spacious private party room. Stop in and watch every minute of every game — home and away! Copyright 2017 The Ambassador Public House. All Rights Reserved.